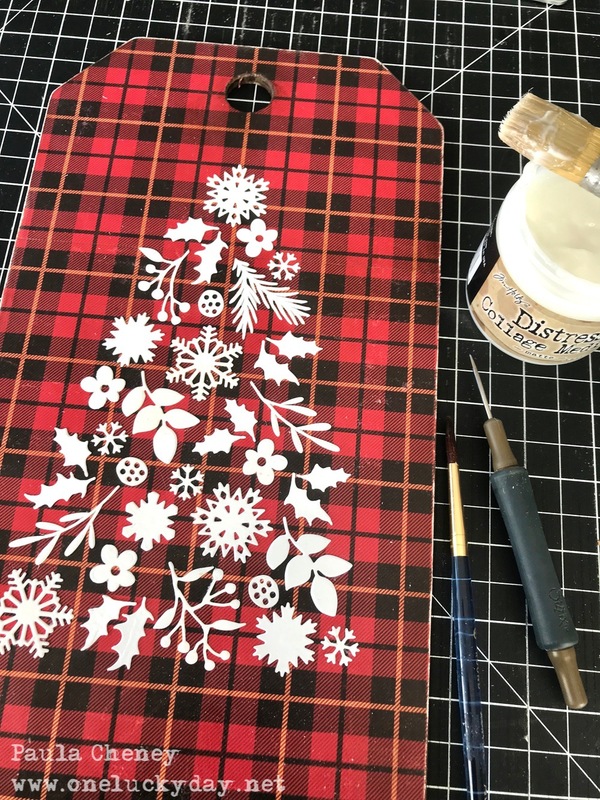 I am sharing an easy Christmas project today featuring die cuts. This project is really about looking at the dies you own in a different light. 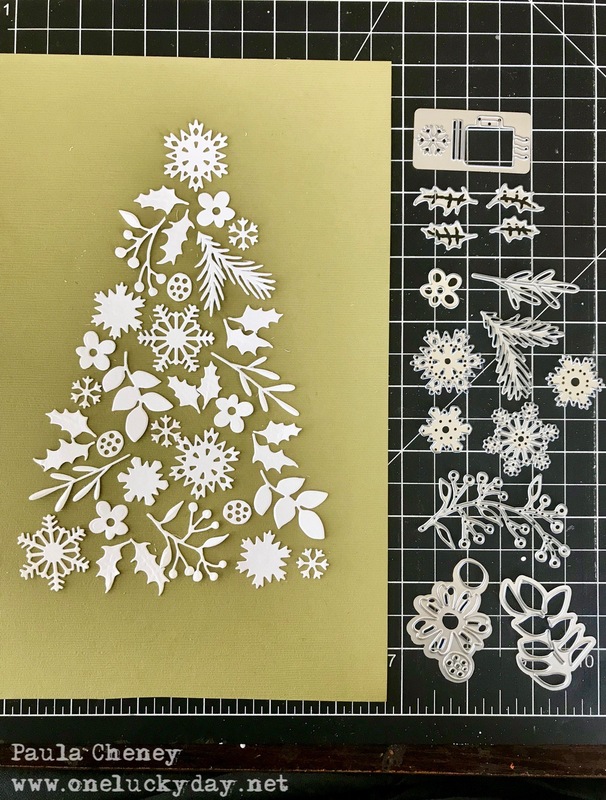 I used six different Thinlit die sets for my Paper Tree. 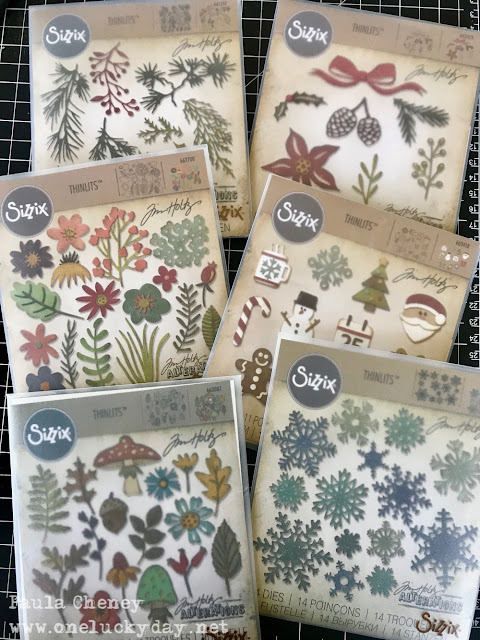 They were already in my collection of dies and maybe in a lot of yours too! Four are Christmas dies, two are not. I chose each die based on shape and scale...and I tested more shapes than I will show in the following process photos. All pieces were cut using Distress Watercolor Cardstock which is nice a thick. 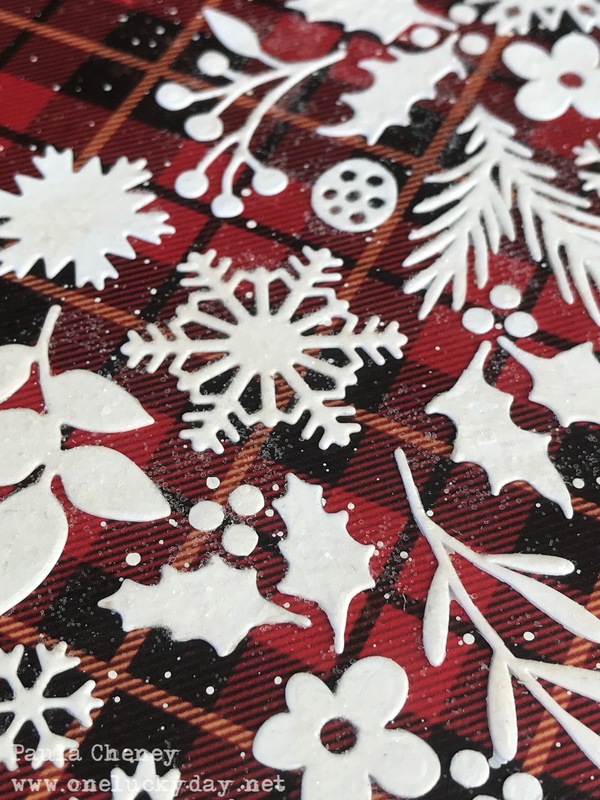 Mini Christmas Things - I only used the tiny snowflake that is on the die with the cup. I built the tree shape on a piece of scrap cardstock to see how big the tree would turn out. Basically I worked large to small...snowflakes, then leaves, holly, etc. Once the tree was formed I could tell a medium Etcetera Tag would be perfect for the substrate. I used Collage Medium to adhere the plaid paper to the substrate. Once dry, I added a layer of Collage Medium over the top of the paper as well. It does take two sheets of the 8 x 8" paper to cover the medium Etcetera Tag. I didn't have any problem matching up the plaid to make it look like one sheet. One by one, I moved the pieces to the tag and recreated the tree. Two things helped in this endeavor. First, I took a picture of the original tree with my phone so I could refer to the photo. Second, I used my Sizzix Die Pick to adjust the pieces. This worked MUCH better than trying to use my fingertip. I glued each piece down with Collage Medium. 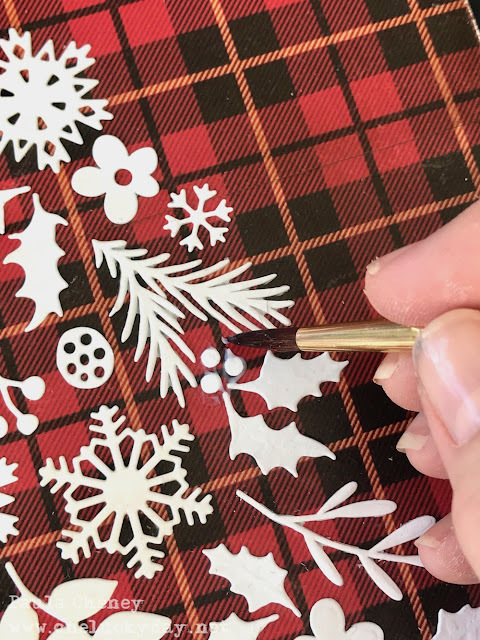 I also always keep a small paint brush nearby when working with small die cuts. 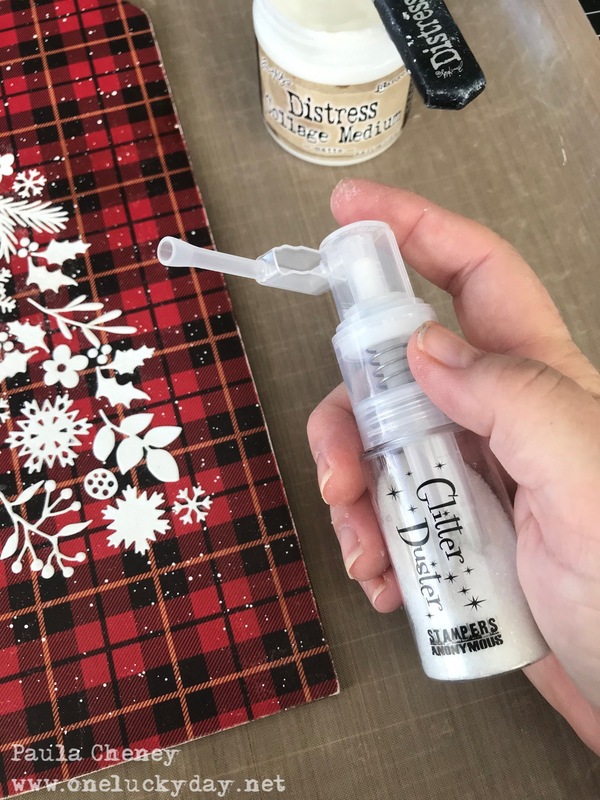 It's the perfect tool to brush away excess Collage Medium. I decided to use a Christmas Quote Chip as the trunk of the tree. 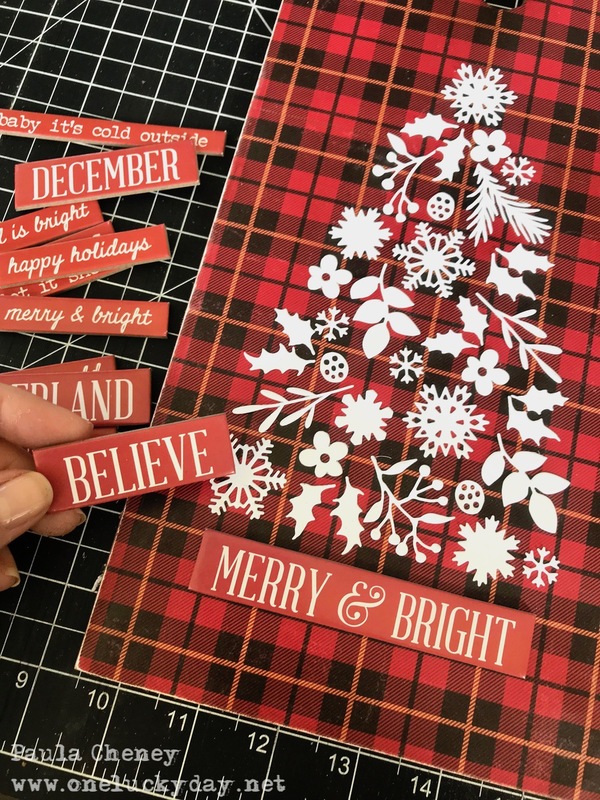 I love Merry and Bright but Believe won out since it was a shorter piece and looked more like a trunk. I had an idea to fill in some of the open space with "berries" to go with the holly leaves. I used a 1/8th punch to quickly make a lot of "berries". Then added them to the tree. 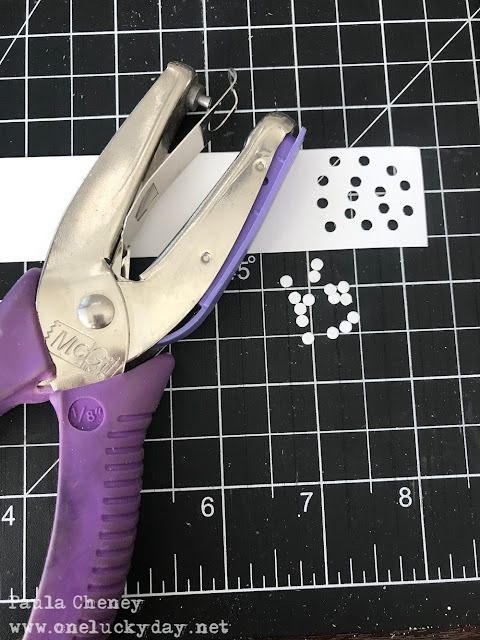 That die pick came in handy again, moving each little circle to the glue. 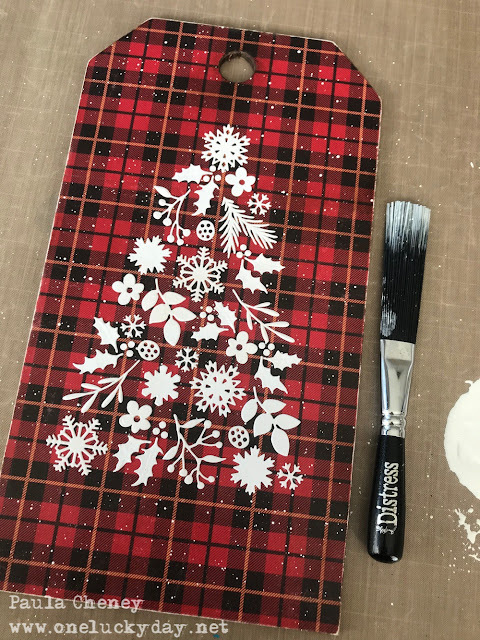 Once again, I used the small paintbrush to brush away the excess glue. 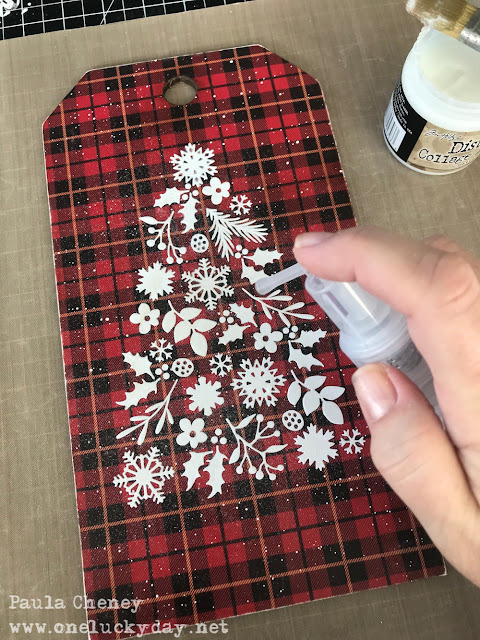 Once all the pieces were in place, I used Picket Fence Distress Paint and a Splatter Brush to create a snowy background over the tag. I LOVE using the Splatter Brush - it just works like magic every single time. I'm impatient so I dried the paint with my heat tool. I decided I wanted a bit a sparkle so I got out the Glitter Duster filled with Rock Candy. Flip the nozzle up to prepare to spray. Working quickly, I added Collage Medium over just the white die cuts before spraying the Rock Candy over the surface. Using the Glitter Duster you get a light dusting of Rock Candy over the tree which is perfect for a piece like this! It's hard to see Rock Candy in a photo but it's there and I know the tree will really sparkle at night. I still needed to add the reinforcer (which I painted black) and a bow at the top of the tag. 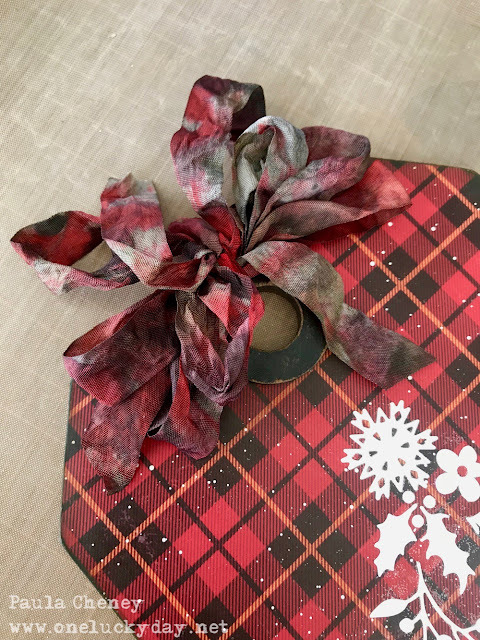 I used Crinkle Ribbon and 4 colors of Distress Spray in this order: Pumice Stone, then Hickory Smoke, Candied Apple and Black Soot. Only Pumice Stone had complete coverage. 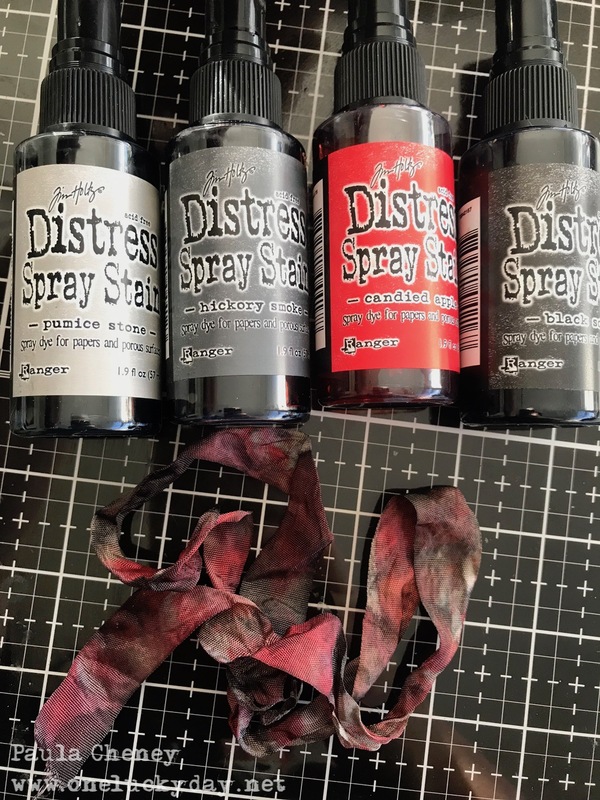 All other colors were randomly sprayed and dried in-between with a heat tool. I added the black reinforcer, then tied a fluffy bow. And there you have it, a cute little piece all made from three pieces of paper! I think it's going to look great as part of my Christmas decor. Remember, you can use whatever shapes you want to create the tree - the bigger the shapes , the bigger the tree! Absolutely genius! 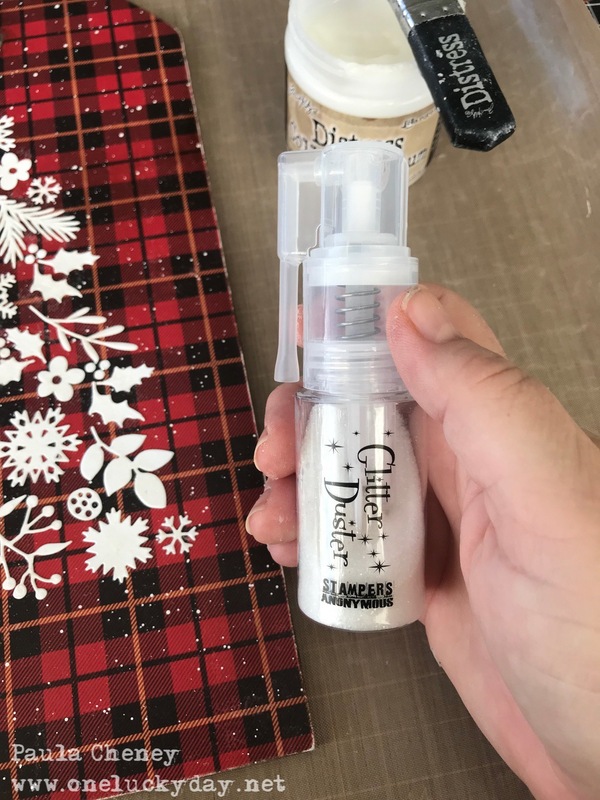 Thank you for sharing this amazing idea! This is beautiful Paula! 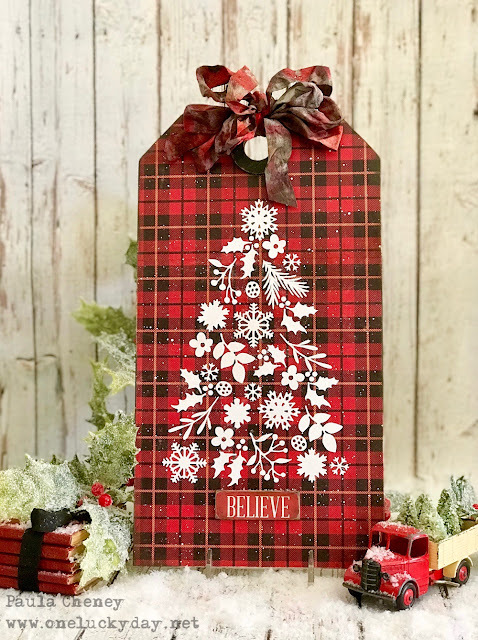 Love the plaid paper background. TFS! Excellent Paula! Brilliant as usual! Oh Paula this is delightful! Fun, simple, affordable and fairly quick. I love it!! So clever Paula, and easy enough for everyone to follow. You are a genius! That's is all! Beautiful tag! You always have the best ideas! Wow Paula! This is just lovely!!! Definitely going to give it a try! What a creative eye you have. Super creative and with great effect... love it! So Festive! 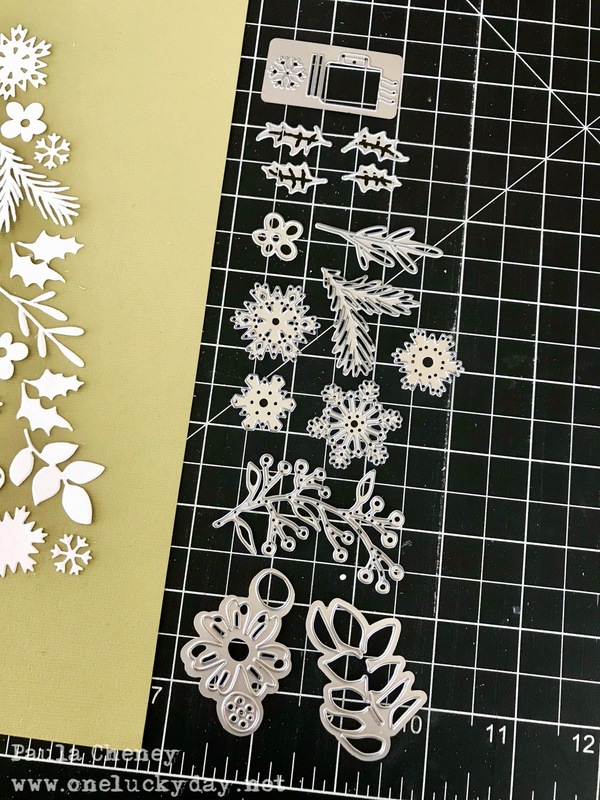 I will use some other french-inspired tiny items but you have inspired me for a similar idea with a gorgeous background and a holiday shape composed of tiny die-cuts! Merci, Paula! You are just so talented and creative!!! What a fabulous idea!! You tree looks wonderful!!! I love this piece!!!! so very creative and gorgeous, love the idea of adding the sparkle too! 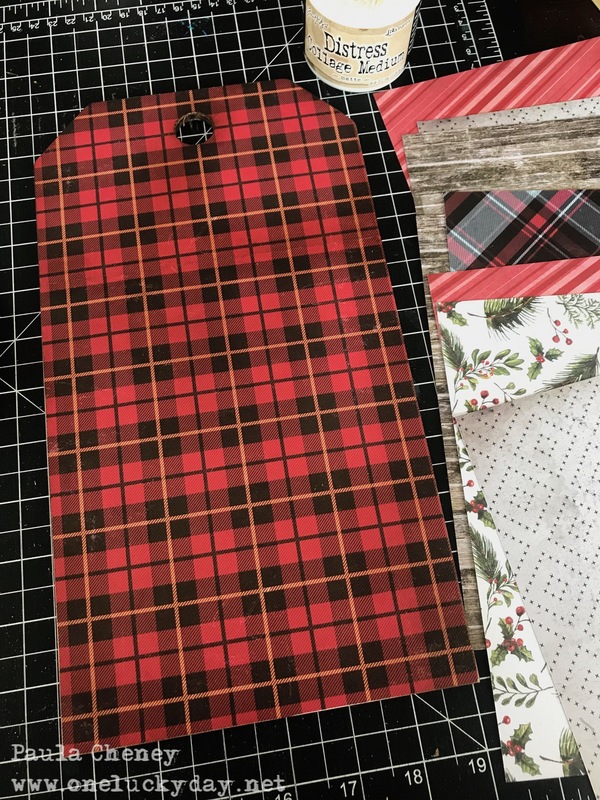 I love it ... not Christmas without some plaid !! I love it, so simple and very festive. Now to find the time to do the project. haha!! This was my second time attending an event at this place, and was my first business event here (the other event was a charity show). Everything at the party venue was perfect, the drinks and food was amazing. Even the coffee was wonderful. I'm curious....did you have this project formed in your mind when you started or did it evolve as you tried different things? Oh the labor on this one with all the dies, and then you go and add tiny berries... Holy Christmas cow! It's beautiful!! !